Jim Garry (Robert Mitchum) is a lonely, washed up drifter who suddenly finds himself in the middle of a battle between a rancher and homesteaders. With few options given the failures in his past, he accepts a job as a hired gun with an old friend, Tate Riling (Robert Preston). Along the way, Garry encounters John Lufton (Tom Tully) and his two daughters, Amy (Barbara Bel Geddes) and Carol (Phyllis Thaxter). 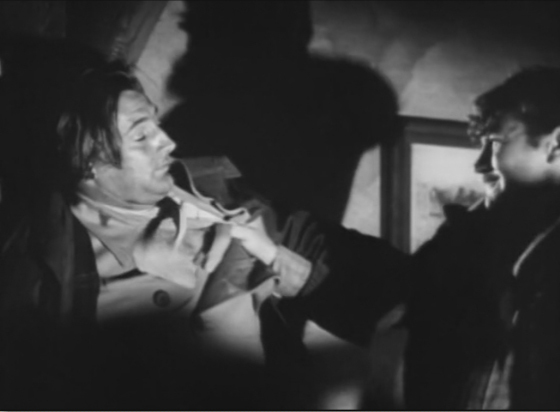 Riling has riled up fellow homesteaders like Kris Barden (Walter Brennan) to deny Lufton the land he needs for grazing his cattle. However, Riling has an ulterior motive which, once Garry learns of it, causes extreme conflict between the two old friends. Frank Faylen plays Jake Pindalest, the government's representative on the Indian reservation for which Lufton's cattle is intended; he's involved with Riling as well. Garry figures out that Riling's motive for involving the homesteaders in a fight against Lufton is a front for his own selfish plans to become the wealthy middleman in Lufton's cattle sale to the government. 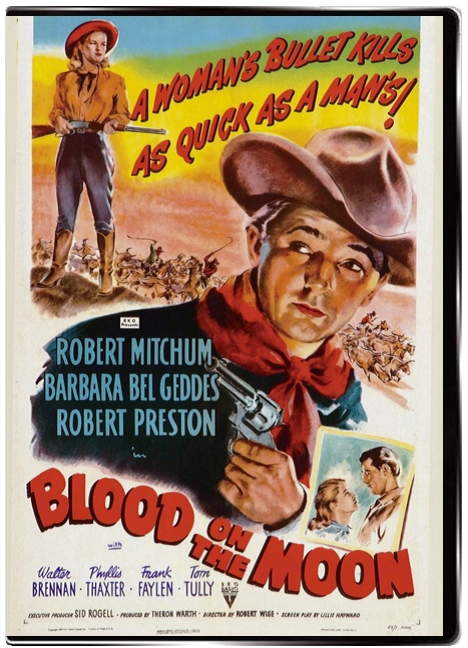 Truly a class A western with a great performance by Robert Mitchum. The concept of the "noir western" is unthinkable without Robert Mitchum. 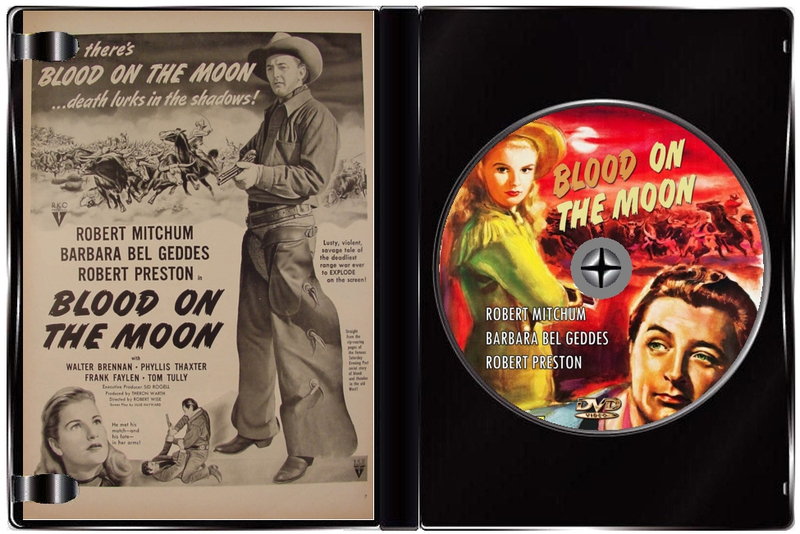 Mitchum, who started his career as a heavy in B westerns and went on to be hailed as the "soul of film noir" for his world-weary cynicism and cool, doomed aura, defined the hybrid genre in 1947 with PURSUED, then followed with BLOOD ON THE MOON. 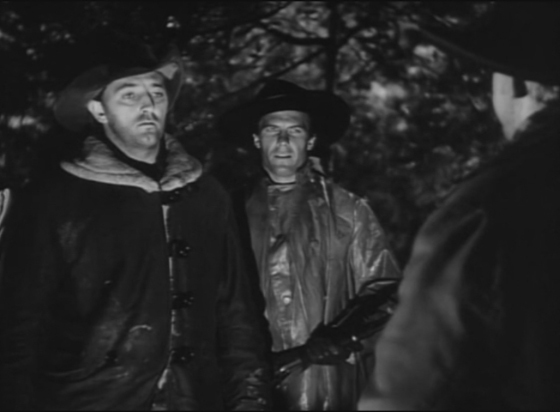 Unlike other tall men riding in the films of that time, Mitchum's character is not a white knight hero coming to save the day. 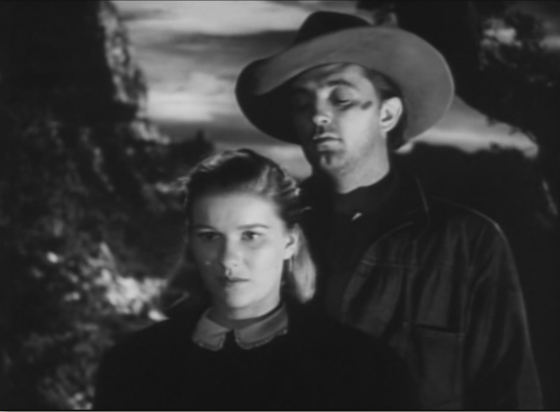 Rather, he is a darkened figure just a step away from being an outlaw - in the noir tradition he will find redemption via the love of an angel, here in the form of Barbara Bel Geddes. Robert Preston is the charming, jovial snake in the grass who manipulates everything and everyone around him. 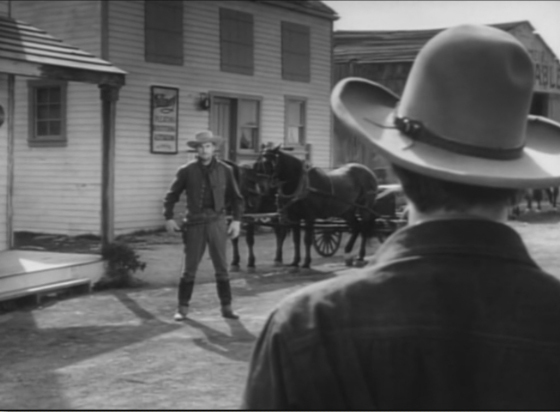 The epic brawl in an out of the way dingy saloon is one of the best movie fights ranking with John Wayne's and Randolph Scott's The Spoilers duel. This is a film that showcases how, for a time, RKO was a studio that pioneered some true innovations in movie story telling. Interestingly this is one of the few pictures of this time to feature bonafide cowgirls who shoot, talk, and ride just like the men. Parasols and petticoats are out of the question in this western, and the ladies are led by Barbara Bel Geddes who you won't catch screaming or huddling in a corner, but instead she is equally as strong as Moody Bob. Great Western!